Testrider.com has continued to bring cycling enthusiasts an unprecedented look at the top products the industry has to offer. With the recent addition of many new reviews the site gives its viewers the opportunity to take a "virtual test ride" of many new products with a simple mouse click. Their ROAD Channel is featuring the all new for 2008 Zipp 202's. They put the aero improvements of these featherweights to the test on their usual So Cal test grounds. Also on the channel is a look at the 2008 Specialized Tarmac Expert and premiering soon, a look at SRAM Force. Their TRI Channel brings you a look at a smaller brand out of San Diego, TITANFLEX. With a unique take on creating performance and comfort the review is worth a look. On the MTB Channel Testrider takes a look at a 29'er as well as the lightest production dual suspension bike available. To help their viewers stay updated on the latest reviews Testrider will be sending a Monthly Program Guide out beginning in the New Year. In association with PolarPak they will be giving a custom Testrider.com hydration pack out to one random Program Guide sign up monthly. 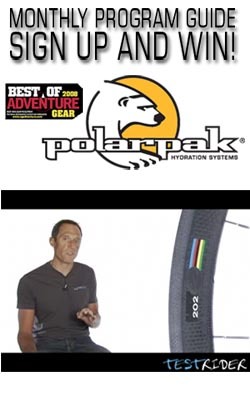 Check out the site for more details and a chance to win hydration from PolarPak, selected as among the Best of 2008 Adventure Gear by National Geographic Adventure Magazine. This Holiday Season their "Share" button has been getting quite a work out as viewers are quick to share products they like with whomever is being their gifts. So far the new ZIPP 202's look like the must have item this year. With new content on line and an already impressive archive of reviews Testrider.com is growing rapidly every month and they expect 2008 top be a big year indeed. Look for new content surrounding the Tour of California to begin premiering in January. For more info on PolarPak and their family of products head to: www.polarpak.com.